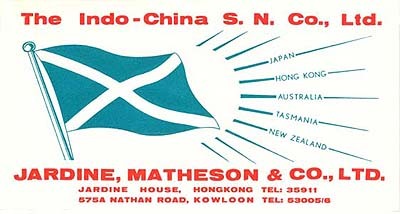 Indo-China Steam Navigation Co. - Jardine, Matheson & Co.
Eastern Star Hong Kong, Brisbane, Sydney, Melbourne, Wellington, Auckland. Returned via Melbourne and Sydney to Hong Kong. See also Dominion Far East Line. This page last updated May 3, 2009.